Archer: Danger Island reminds me of Disney’s TaleSpin… but with humor for an older audience. In both situations, the cast of characters from one story is put into a tropical island, in different roles, with adventures in jungles and in the air. Also, both shows involve the main characters flying a seaplane. I would have compared this season of Archer to Tales of the Golden Monkey, but that reference is for an older audience, and I like cartoons better anyway. In much the same way that Baloo in TaleSpin answered to an often upset and demanding female boss, so does Archer. In this case, his mom. Malory Archer owns the plane and other transportation services associated with her hotel, located on a remote South Pacific island, part of French Polynesia, in 1939. Malory’s character and attitude hasn’t changed much from her usual role, running a spy agency in previous seasons. Neither has her sons’ attitude or that of any of the rest of the returning ensemble cast. Pam still plays a friend and coworker to Archer, with the same lowbrow humor we’ve come to love. Cyril has the same cowardly demeanor he usually sports, but has a German accent this season. Since this show is set in 1939, you’ll have to draw your own conclusions as to what that means and what he’s up to. But for those of us who’ve seen the Indiana Jones movies, that probably means Nazis. Lana, as always, is the object of Archer’s affections. In this season, she is Princess Lanaluakalan of the indigenous island people (the movie Princess Ka’iulani, about Hawaii, comes to mind). Cheryl is as rich, spoiled and overly dramatic as ever. There’s really only two big changes to characters this season. First off, Dr. Krieger is now a talking parrot. Not like how a normal parrot speaks or mimics human phrases, this parrot actually speaks like a human. It’s really funny to see Cheryl’s reaction to this, while everyone else just kind of accepts it. The other change is to Ray. Instead of an employee of Malory, he’s now in charge of the police on the island and has a French accent. There’s a nice homage to Casablanca, when Ray delivers the same lines that Louis gave: “I’m shocked! Shocked to find that gambling is going on in here.” It’s a great nod to a classic, considering the time period that this season of Archer is set. Archer isn’t the first show to put its recurring ensemble cast of actors in different roles in a different time period. People who watch American Horror Story are used to this sort of thing happening every season. Moviegoers who watch Christopher Nolan’s films often see the director cast a handful of actors in different roles in his various movies; it feels like half the cast of Inception was in the Dark Knight films. Personally, I remember watching the A&E series, A Nero Wolfe Mystery, where the supporting actors would be re-cast in different roles, as different characters in future episodes. It’s a shame Nero Wolfe got cancelled after only two seasons, because the acting was really good and the principle roles were perfectly cast. At any rate, the practice of keeping an ensemble cast around is a good way to keep the actors employed and lets the audience see some familiar faces on a regular basis. For Archer, it’s a way to keep the series fresh. Considering how funny I find the dynamic between certain characters, I’m all for it. The show had been leading toward this sort of thing over the last couple of seasons and I’ve been enjoying the ride. I especially liked Season 5, Archer Vice (think Miami Vice), and Season 7, which saw the team move from New York to L.A. to go from a spy agency to a small-time detective agency. Neither of which were quite the departure that last season, Archer Dreamland was. That season, Season 8, saw the gang supplanted to a 1947 L.A. noir mystery. I admire the risk that the show took — and we probably wouldn’t have this season’s change in setting without last seasons’ — but Season 8 was a bit… dark. 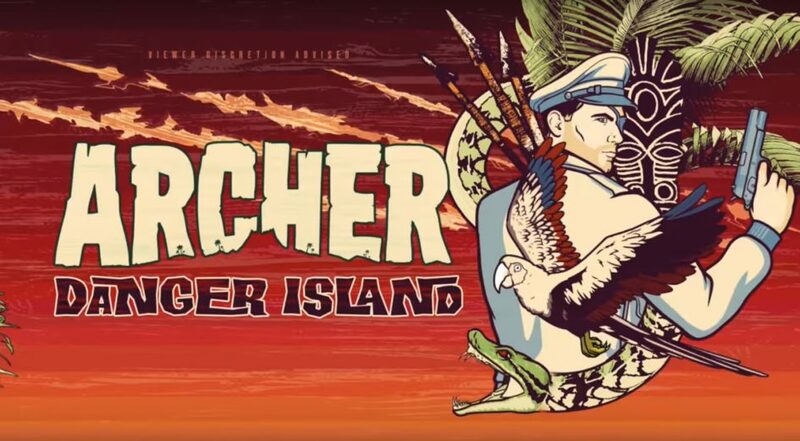 But it looks like Season 9, Archer: Danger Island, is going to be significantly lighter, including the tropical island setting, the color palate of the animation and the focus on adventure over mystery… not to mention the humor. It’s almost a shame that Archer is a weekly show, because I immediately wanted to watch the next episode after watching the season premiere. I’m so used to being able to binge-watch series on Netflix and Amazon. I’ll just have to look forward to when I can watch the next episode of Archer: Danger Island on FXX.